“Devotion: Humans and Their Four-Legged Soulmates” by Dobie Houson takes us on a journey through heartwarming stories about humans and their special connections with their pets. Each chapter shares a different story. Each one is beautiful. Most of the stories are about dogs or horses, but there are also other animals featured, such as one story about a lion! While it is sad to know that the journey has ended for some of these special souls, it is good to know that their stories are immortalized between these pages. There is an incredibly beautiful picture of a young lady and her horse on the back cover of the book, and I found myself looking for more information after reading their chapter. The author Dobie Houson is also a special soul. She is the founder of Finding Forever, a foundation bringing aid and awareness to animal rescue causes. A portion of the sales from her book will be donated to her foundation. Dobie is an animal communicator that has special telepathic abilities that aid her in helping humans gain a greater understanding of some of the things their beloved pet wants them to know. Her ability to communicate with animals allows her to let the humans know what their fur family members are trying to tell them. This is very helpful for people who are trying to resolve behavioral issues or for those who having to say goodbye. I think the connection allows healing to occur in both the two legged and the four-legged beings. I found myself deeply affected by some of the chapters. My life has been greatly enriched by the animals that have come into it, and I would not be who I am today if it wasn’t for my interactions with them and the lessons that I learned. Today, I have five rescues that are extremely unique characters. Being able to read about the special connections of others with their animals really brought home what a valuable gift we have! I wish I had the author’s talent for being able to communicate with them on a deeper level. While I think my connection is extremely precious, I still can’t always understand why they do the things that they do. 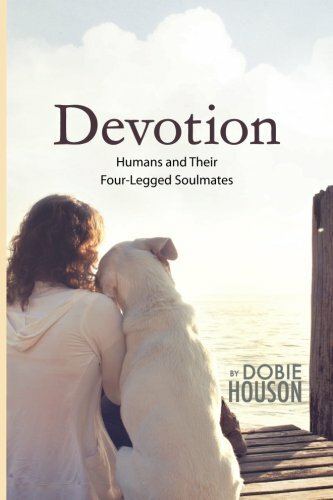 “Devotion: Humans and Their Four-Legged Soulmates” by Dobie Houson is the perfect gift for animal lovers, including yourself!